Will Scientists Ever Discover Life Without A Home Planet? The origin of life on Earth may have nothing to do with Earth at all. By discovering the properties of the other worlds in our Solar System, it became clear that Earth was unique. Only we had liquid water on the surface; only we had large, complex, multicellular life whose evidence could be seen from orbit; only we had copious amounts of atmospheric oxygen. Other worlds may have subsurface oceans or past evidence for liquid water, with perhaps single-celled or prior life on it. Sure, other solar systems may have Earth-like worlds, with similar enough conditions that life arose there. But not only is an Earth-like world not necessarily required for life to exist, recent evidence shows us that having a world at all might not be needed. It may be possible to have life in the depths of interstellar space itself. Signatures of organic, life-giving molecules are found all over the cosmos, including in the largest, nearby star-forming region: the Orion Nebula. Image credit: ESA, HEXOS and the HIFI consortium; E. Bergin. where it can make copies of itself and pass on the information encoded within it to the next generation. There are fine lines between life and non-life that aren’t necessarily well defined, as bacteria are in, crystals are out, and viruses are still up for debate. The formation and growth of a snowflake, a particular configuration of ice crystal. Although crystals have a molecular configuration that allows them to reproduce and copy themselves, they do not utilize energy or encode genetic information. Image credit: Vyacheslav Ivanov / http://vimeo.com/87342468. But why do we need a planet at all to arrive at life? Sure, the aqueous environment provided by our oceans might be where the life we know thrives, but the raw ingredients are found all throughout the Universe. Stars, through planetary nebulae, supernovae, neutron star collisions, and mass ejections (among other processes), burn hydrogen and helium into the full suite of stable elements found on the periodic table. Given enough generations of stars, the Universe becomes filled with all of them. This includes large amounts of carbon, nitrogen, oxygen, calcium, phosphorous, potassium, sodium, sulphur, magnesium, and chlorine. Along with hydrogen, these elements make up over 99.5% of the human body. The elements that make up the human body and are most essential to life take up a variety of locations on the periodic table, but all can be generated by the processes of a few different types of stars in the Universe. Image credit: Ed Uthman (L); Wikimedia Commons (R). In order to get these elements to bind together into an interesting, organic configuration, you need a source of energy. While we have the Sun here on Earth, there are also hundreds of billions of stars in the Milky Way, along with a wide variety of interstellar energy sources. Neutron stars, white dwarfs, supernova remnants, protoplanets and protostars, nebulae, and much more fill our Milky Way and all large galaxies. When we look to the ejecta from young stars, at protoplanetary nebulae, or at the gas clouds in the interstellar medium, we find all sorts of complex molecules. These include amino acids, sugars, aromatic hydrocarbons, and even esoteric compounds like ethyl formate: the olfactory molecule that gives raspberries their characteristic smell. 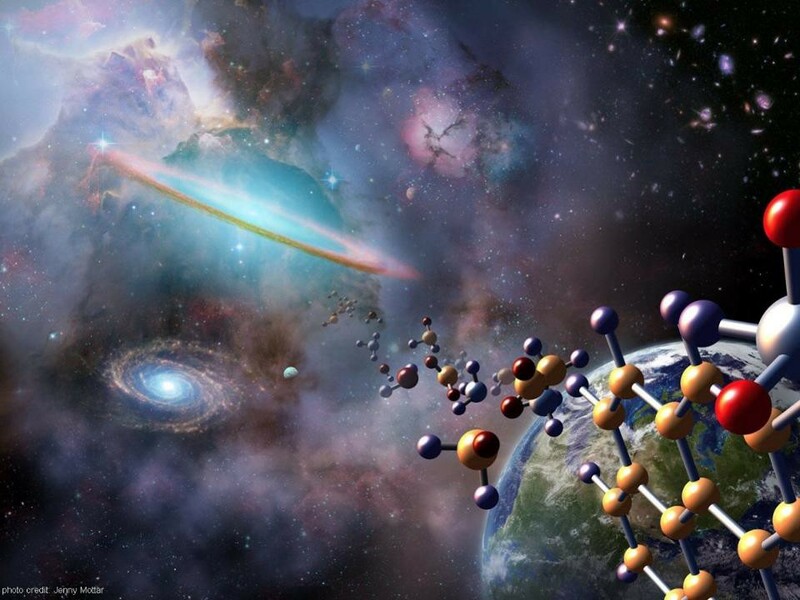 Organic molecules are found in interstellar space in many varieties, including buckminterfullerenes, which have been discovered in various locations. Image credit: NASA / JPL-Caltech / T. Pyle; Spitzer Space Telescope. There’s even evidence for Buckminsterfullerenes (or Buckyballs) in space, in the exploded remnant of dead stars. But if we come back to Earth, we can find evidence of these organic materials in some very inorganic places: inside of meteors that have fallen from space to the ground. Here on Earth, there are 20 different amino acids that play roles in biological life processes. In theory, all the amino acid molecules that make up proteins are identical in structure, with the exception of an “R-group” that can be made of different atoms in various configurations. In terrestrial life processes, there are only these 20, and virtually all the molecules have a left-handed chirality. But inside these asteroid remnants, over 80 different amino acids can be found, of left-and-right-handed chiralities in equal abundances. Scores of amino acids not found in nature are found in the Murchison Meteorite, which fell to Earth in Australia in the 20th century. Image credit: Wikimedia Commons user Basilicofresco. Mammals, from 0.1 billion years ago, have 6 × 10⁹ base pairs. Fish, from 0.5 billion years ago, have ~10⁹ base pairs. Worms, from 1.0 billion years ago, have 8 × 10⁸ base pairs. Eukaryotes, from 2.2 billion years ago, have 3 × 10⁶ base pairs. And Prokaryotes, the first form of life from 3.5 billion years ago, have 7 × 10⁵ base pairs. If we graph that, we find something remarkable and compelling. On this semilog plot, the complexity of organisms, as measured by the length of functional non-redundant DNA per genome counted by nucleotide base pairs (bp), increases linearly with time. Time is counted backwards in billions of years before the present (time 0). Image credit: Richard Gordon and Alexei Sharov, arXiv:1304.3381. Either life began on Earth with a complexity on the order of 100,000 base pairs in the first organism, or life began billions of years earlier in a much simpler form. That could have been on a pre-existing world, whose contents migrated into space and eventually came to Earth in a great panspermic event, which is certainly possible. But it also could have been in the depths of interstellar space, where the energy from the galaxy’s stars and cataclysms provided an environment for molecular assembly. It may not necessarily have been life in the form of a cell, but a molecule that can collect energy from its environment, perform a function, and reproduce itself, encoding the information essential to its existence in the reproduced molecule, just might qualify as life. A rich nebula of gas, pushed out into the interstellar medium by the hot, new stars formed in the central region. Earth may have formed in a region like this, and this region may already be teeming with primitive forms of life, under some set of rules and definitions. Image credit: Gemini Observatory / AURA. So if we want to understand the origin of life on Earth, or of life beyond Earth, we might not want to go to another world at all. The very secrets to unlocking the key to life may lie in the most unlikeliest places of all: the abyss of interstellar space. If this is where the answer lies, it may teach us that not only are the ingredients for life found everywhere in the cosmos, but that life itself may be everywhere as well. Perhaps we just need to learn how and where to look. The presence of glycoaldehydes — a simple sugar — in an interstellar gas cloud. Image credit: ALMA (ESO/NAOJ/NRAO)/L. Calçada (ESO) & NASA/JPL-Caltech/WISE Team. One thing is for certain, however. If life does exist in interstellar space, then pretty much every world that forms in the Universe today will have these primitive lifeforms being brought to it at the time the worlds themselves form. If there’s any protection from the deadly radiation of the parent star, plus an energy source and a friendly environment for that life to thrive in, evolution to something complex may be inevitable. Not only may scientists someday find life without a home planet, but the life on our world may owe its origins to the depths of interstellar space itself.